Risparmia $11.00 scegliendo ora questa opzione. Dynamically loads categories to reduce load time. When a website has a large number of categories with multiple levels, this module can improve the performance of the website by loading only the top level of categories initially and loading the other levels as needed using AJAX. It can also be used to hide empty categories, so the merchant doesn't need to disable categories before they've added products and then enable them when adding products. This module adds many features to the standard category block that comes with PrestaShop. Along with the standard "Maximum depth" and "Sort order" options, it has a separate "Footer maximum depth" option. Categories can be dynamically loaded using AJAX to reduce load time. The module can also save the state of the categories so they are reloaded in the same place when navigating between pages. There are many options to control the category tree. It is possible to hide empty categories, so that categories without products are not displayed in the category block. Parent categories and sub-subcategories can be hidden to display only subcategories of the current category. Breadcrumbs can be added to make it easier to return to parent categories. 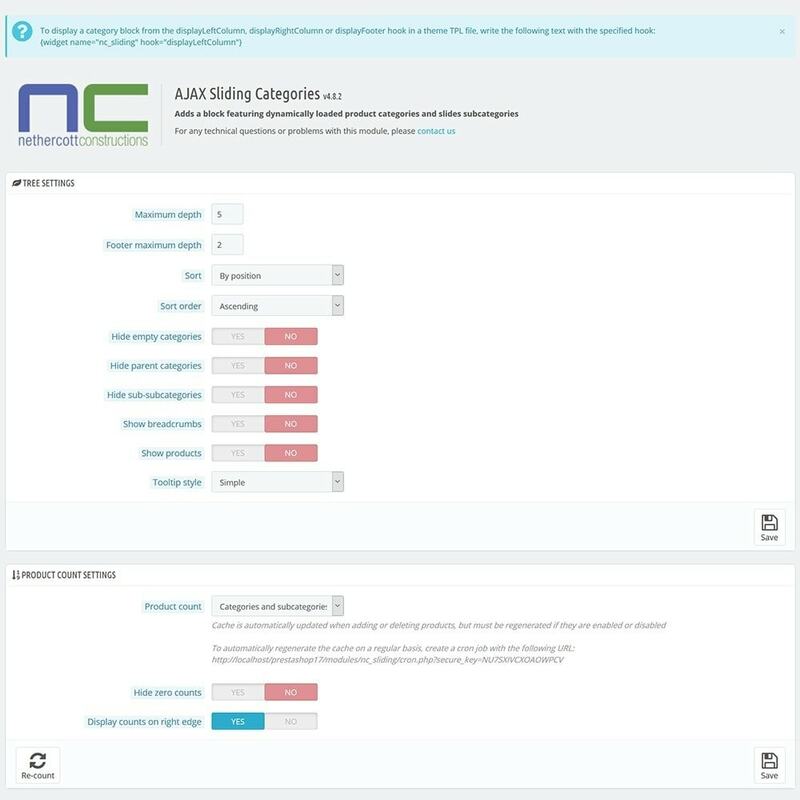 There is also an option to add links to products in the category block. The module also allows the number of products in each category to be displayed after the category name. The product count can include only products directly in the category or include subcategories as well. To improve performance, the module generates a product count cache so that products do not need to be recounted every time the page loads. There are also options to hide the product count from empty categories and line up the counts on the right edge of the category block. Along with the default option to display +/- buttons next to each parent category to allow subcategories to be expanded and the option to display all categories so expanding and collapsing isn't required, there is an option to use an accordion to hide the +/- buttons and use the category links to expand categories instead. There is also an option to allow the category link to be clicked a second time to collapse it and return to having no subcategories open. The module also has the option to specify which categories should be open by default when loading non-category-and-product pages. When using the accordion, only one category can be expanded by default. When using the +/- buttons, multiple categories can be expanded by default. The module has the option to display simple tooltips, formatted tooltips or no tooltips when hovering over categories in the block. Copy the "blockcategoriesnc" or "nc_sliding" directory to the modules directory in your PrestaShop store, then upload it to your server using an FTP client like FileZilla. The module should then appear in the "Front Office Features" section on the "Modules" tab. Click the "Install" button to install the module. The module should then appear at the bottom of your left column. Click the "Configure" link to change the module's settings. For terms and conditions and more instructions, read the files in the "docs" directory of the module. Although the module is installed at the bottom of the left column by default, it can also be transplanted into the "displayRightColumn" hook. The module stores all of its styles in a CSS file that can be customised from the configuration page of the module. There is also a troubleshooting section that can be used to reduce the number of categories loaded in a single query to reduce the module's memory usage and a button to repair the category level depths if they become corrupted. This module has been tested on a site with 200,000 categories. 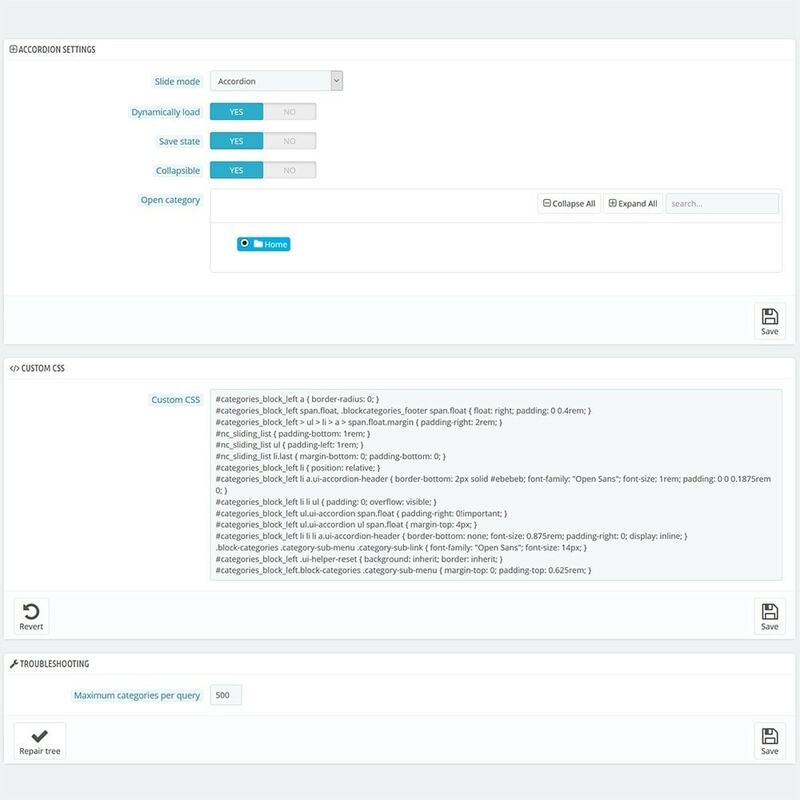 While regenerating the product number cache or repairing the category tree, a progress screen is displayed so the merchant can see how many categories have been processed. This module can add the number of products in each category after its name. This makes it easier for customers to browse the catalog and know exactly how many products they'll see before they click a category link. The module also has an "Accordion" mode that removes the small +/- buttons and allows customers to click the larger category links to expand subcategories. 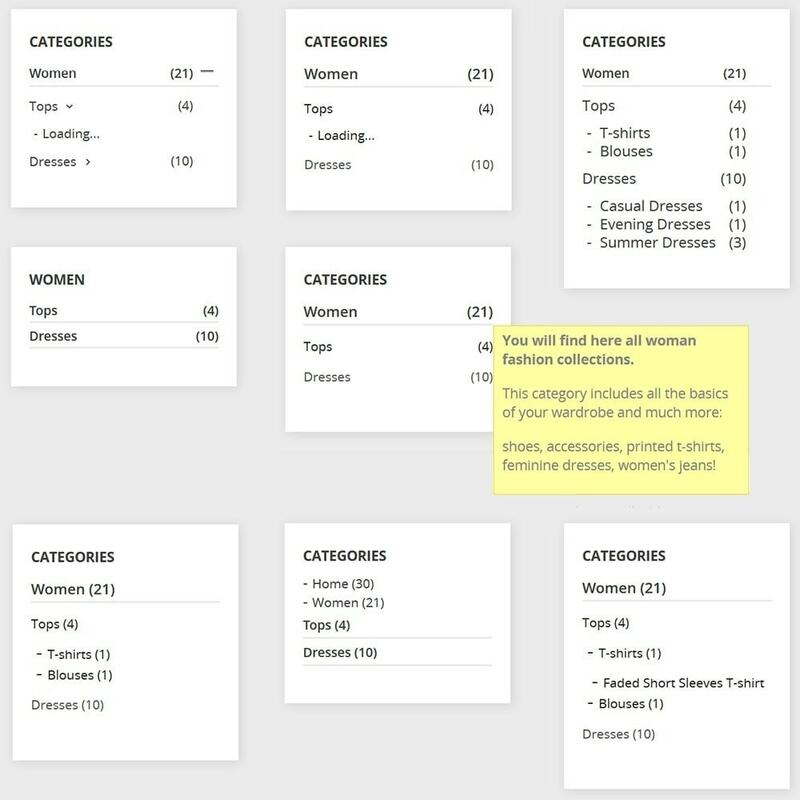 Displays categories in dropdowns using AJAX. This module displays galleries of images, videos and other files on your website. It uses the latest version of Fancybox, which provides a great touch-screen experience with swipe navigation, pinch to zoom and swipe to close. Choose from 30 theme presets including colors, backgrounds and fonts. Add spam protection and various customizations including adding to cart from product listings.